This ain't no nightingale. The Brainfever Bird performs a pretty good audio rendition of delirium, though! I guess it depends on whether you prefer Bach or Beethoven. Common because they can be found throughout India, Pakistan and Sri Lanka. They eat insects and are especially well adapted to taking those caterpillars that are so hairy they hurt your hand. 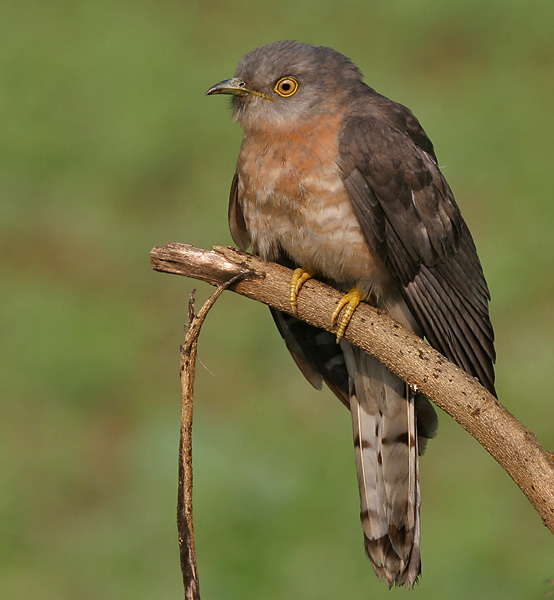 The Common Hawk-cuckoo has strong guts that separate the nice from the nasty so that the bristles can be coughed up as a pellet. It's just like how owls deal with bones and fur, but I never imagined such a procedure would be necessary for caterpillars! The Hawk-cuckoo bit comes from them being a Hawk-cuckoo. Ahem. 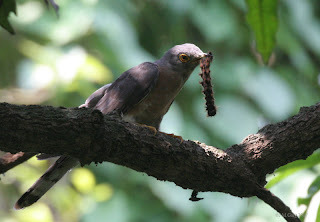 These are a whole bunch of cuckoos that look a lot like hawks, in this case a sparrowhawk called the Shikra. They even mimic their flight and the way the raptor lands on a perch. 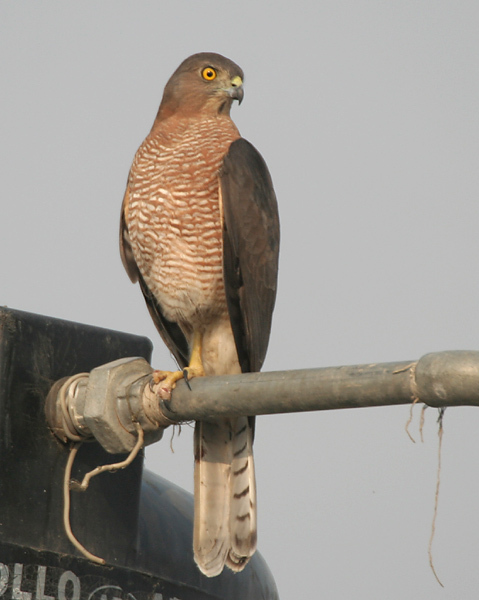 It's all so convincing that many birds and squirrels raise the 'bird of prey alarm' when a harmless Common Hawk-cuckoo comes into view. Except that they're not so harmless. They are brood parasites, like many other Cuckoos. Their chosen victims are a few species of babbler. A single egg is laid in the host nest. Once it hatches, the chick will usually set about murdering it's step-siblings by kicking out the other eggs. The poor foster parents will then feed this invasive killer for several weeks. Now, I'm not at all sure if those babblers really sound like the cheerful gurgle of a babbling brook. I do, however, know that the Brainfever Bird has a maddening cry that sounds almost exactly as I feel when I have a terrible flu. It's the awful repetition and that mounting sense of emergency. It has the desperate sense that something must be done but you can't quite do it. All it needs is the appropriate visuals and your delirium is complete. "Brainfever" indeed. Other interpretations have the same sense of frenzy. The Marathi one translates to "the rains are coming". The Hindi to "where's my love". The Bengali is worse of all, it translates to "my eyes are gone". My eyes are gone... My eyes are gone... My eyes are gone! MY EYES ARE GONE!! MY EYES!!! WHERE ARE MY EYES!? my eyes are gone? too funny! he looks a bit crazed. Yeh, he looks like he had way too much coffee.